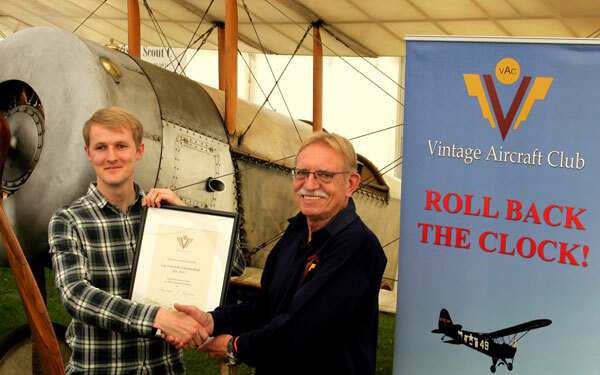 The highly popular Vintage Aircraft Club 'Liz Inwood Taildragger Scholarship' for 2017 has been awarded to Benjamin Pilgrim, a 25 year-old who currently flies from Liverpool airport where he is training to be a commercial pilot. Benjamin has a clear passion for vintage machinery, including his daily drive, a 1969 Austin Healey Sprite. His Liverpool University engineering dissertation was "Handling Qualities of Vintage Aircraft" and as part of his course he created a 1912 Blackburn Monoplane simulator flight model, subsequently test flown by Shuttleworth Collection chief pilot Roger'Dodge' Bailey! The Scholarship, named in memory of the -late Tiger Moth pilot and flying instructor Liz Inwood, is funded by donations from the Vintage Aircraft Club, Light Aircraft Association and the Inwood estate. It is aimed at young pilots who wish to convert from typical flying club nose wheel designs to older tailwheel types, potentially opening the door to flying a wider range of vintage and classic types. Benjamin will be awarded five hours flying to assist in learning classic 'taildragger' handling, which now forms part of the now-required differences training. "The VAC has been in existence for over 50 years, and currently has some 300 members who own and operate almost 200 classic and vintage aircraft" said chairman Peter Wright. "In common with many organisations today, the Vintage Aircraft Club is most conscious of a rapidly widening age gap in its membership. "If our club is to thrive and survive, we recognize that not only must we attract new younger members, but must also hand on the skills required for younger people to operate the older type of conventional undercarriage aircraft — or taildragger as they are more commonly known. We also have to accept that flying is generally not a cheap sport, and can strain the financial resource of most young people. The Scholarship is one initiative to help address these challenges." The award was presented to Benjamin at the Light Aircraft Association Rally at Sywell Aerodrome, Northampton on Saturday 2"d September 2017. It should be emphasised to all those young people who made an application this year but were unsuccessful, that the VAC will be offering this award again next year, and for the forseeable future, so apply again in 2018.